Toyota’s Prius is not just a leader when it comes to hybrid technology; it is a powerful presence on the roads with its fuel efficiency and sport styling. Toyota redesigned the Prius for 2017 and went to great lengths to ensure that it is as eye-catching as it is economical. It has been given a sleek exterior filled with dramatic lines from the grille to the trunk. Headlamps reach back towards the doors and offer more than visibility; they are an integral part of an aggressively designed front end. There is a lot of cargo room in this four-door hatchback, and that means that you can take more people and gear with you when you head off on your vacation or other cross-country trip. Remember, it gets outrageous fuel efficiency, so driving it across the country should be a standard part of your “To Do” list. When you’re driving on the highway, you might notice how quiet the interior is thanks to those aerodynamic lines in the new design. It’s the aerodynamics of it that helps it get a combined 4.5 L/100km. 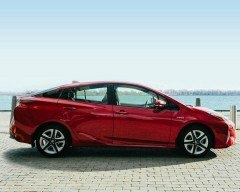 In addition to its solid body, Toyota made the Safety Sense package standard on all trim models of the Prius. That means you get the pre-collision system with pedestrian detection, lane departure alert with steering assist, dynamic radar cruise control and automatic high beams with your new Prius. This suite of safety related technology has helped the Prius get Top Safety Pick awards, and the Canadian Black Book gave the Best Retained Value Award a couple years in a row to Prius models. 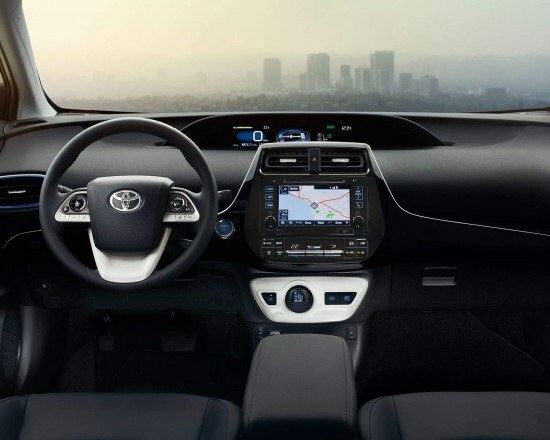 The Prius comes equipped with all types of technology when it comes to how it derives its power, but Toyota also puts some of that technology at your fingertips with the Technology Package. A Heads-Up display puts all of the dash data that you need like speed, maps and other information right in front of you, so your eyes never need to leave the road. It’s futuristic and as cool as the Starship Enterprise. An auto dimming rearview mirror keeps the glare from headlights behind you out of your eyes by adjusting to the lights. This makes it possible to continue to keep an eye on surrounding traffic without being blinded. Lumbar support and an 8-way power adjustable driver’s seat helps you find the perfect position for long distance driving, which is what you’ll be doing thanks to the fuel savings. Softex heated front seats ensure that the ride is nice and comfortable. There are three models in the Prius 4-door hatchback lineup that offer a number of features. The Prius also comes in an SUV body – the V – and a compact 4-door hatchback – the C. Toyota has a hybrid for you no matter where you live or what your driving habits. Toyota has something even more exciting on the horizon with the Prius Prime, which is a plug-in Prius that engineers are working on that will propel the Prius into the future by creating an EV car built around the Prius. All of Prius models are equipped with the latest technology, an electric motor and an HV lithium ion battery. Come by and see all of the other features that we couldn’t list here. Test-drive the new 2017 Toyota Prius today.